Storytelling, storytelling, and more storytelling. Seems like every marketing book, blog (including mine if you've been reading this week's posts) and study is talking about how we should be using storytelling as a marketing technique. I couldn't agree more. Unfortunately, I think most attempts fall short. Earlier this week -- I made the point that A) It seems that despite all the hype -- we're doing less real storytelling today and B) storytelling is hardly a new tactic. Marketers clearly believe that storytelling is a critical component of their marketing efforts. 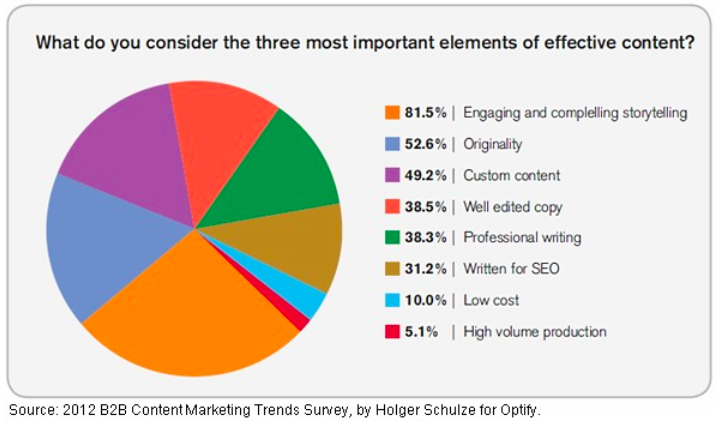 As you can see by the chart above, according to a previous B2B Content Marketing Trends survey conducted for Holger Schulze for Optify, 81% of respondents listed engaging and compelling storytelling as one of the three most important aspects of content marketing. So -- no argument that marketing's version of storytelling is critical to a business' communications success. The question is -- why are so many companies doing it badly and not experiencing the results they want? The stories don't evoke an emotion: There's not a memorable story around that isn't seeded in emotions. For some businesses, especially those in the B2B sector, it's hard to imagine what emotions their products or services might trigger. That's because the marketers are staying at the features level of sales, not delving into the benefits that lie beneath. It might be as simple as your prospect is afraid if they make a bad decision, it will cost them their job. Or it could be that what you sell is helping your clients fulfill their reason for existing -- which to them is very emotionally motivated. If you dig deep enough, you'll find the emotions behind your stories. Be sure you expose those in your storytelling so that your audience can relate to and empathize with the people in the tale. The stories don't use data to lend credibility: As we discussed in my post about the Revolutionary War book -- what made those stories so dramatic and grabbing was the facts that were dotted throughout. As the folks at the Content Marketing Institute points out in this blog post -- data can be used in a variety of ways to tell your story. Think visual data like an infographic or let the data suggest a new angle or insight for both you and your audience. The story doesn't take us on a journey: In marketing's version of storytelling, we often take shortcuts to get to the big reveal. But in doing that, we rob the audience of the arc of the story. Every story is, in essence, a journey that chronicles the the problem, the fight to solve the problem and how things are better once the challenge is resolved. But a great story lets the journey also help the audience see the motivations, frustrations and worries of the characters while they try to face the problem. The outcomes are also wrapped in more than just the tangible results. When the story is rich with details - we also learn more about the intangible results and ultimate value of delivering the right solution. The story doesn't include a next step/call to action: Here's where most marketers really miss the boat. A well crafted story draws the audience in, helps them connect with the main character and feel their common pain. As the story evolves, the prospect is pulling for the character -- because in reality, the character bears a striking resemblance to them. They experience the ups and downs within the story and as the story delivers the happy ending -- the prospective customer is thinking and feeling relief and a desire to share in that sort of outcome. So marketing's version of storytelling is all too often, a big tease. You led them right to the edge -- get them hungry for what you're selling but don't give them a clear and defined next step. Ask yourself -- what do I want them to do next and be sure you make it easy and quick to take that next action. If you don't include this as a part of your storytelling -- the whole point of telling the story in the first place is wasted. You aren't a court jester earning your supper. You're trying to help someone decide whether or not you hold the answer to their problem. Once you demonstrate that you are the right choice -- be sure you give them a chance to tell you so. What do you think? Can you tweak the way you're telling your company's story so that it drives leads and sales? Drew's original post can be found as his blog Drew's Marketing Minute.